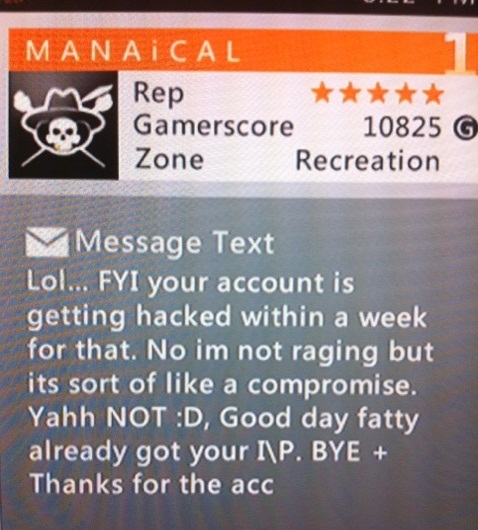 Our submitter won a R6V2 match against M A N A i C A L, but assures us she still has her account. I can’t believe how common these sort of empty threats are on Xbox Live, since everyone knows this sort of thing is virtually impossible to pull off in the way this person is explaining that it is. Plus it usually results in a permaban if you get reported. How does Live have so many retards? I never see this level of stupidity on PSN. I’m surprised that enough computer illiteracy exists that people still believe this sort of threat — at least enough that people still try to use it. Knowing someone’s IP address is so meaningless for most hacking, particularly something like a 3rd-party virtual account like XBL. le sigh. Oh noes! My external IP? You mean that thing that every goddamn website I visit ever stores, and is dynamically assigned to me by my ISP? OH DEAR GOD NO. WITH THAT INFORMATION, YOU COULD ALMOST CERTAINLY PING ME. PLEASE, I WILL DO ANYTHING, I WILL NOT INFORM THE AUTHORITIES IF YOU SPARE MY IP! MY CHILDREN USE THAT. U R SO LEET! I’m just kidding. I have no children. …if you really are hacking someone’s account, maybe don’t message the person with your own account and confess to what you are doing. Not that I think he actually tried to hack her, but still. Looking back at this one the funniest thing popped into my head.